Swedens finest on tour! 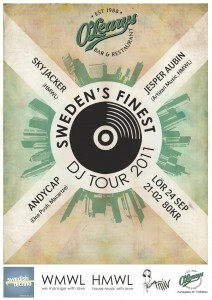 Özgur Can, Miss Dilemma, Andycap, Tiger Stripes, DJ Bacid, Jesper Dahlbäck and HMWL are on the Scandinavian roads this autumn as a part of the Swedens Finest DJ Tour that we are proudly managing. Full tour and booking info here.